look at, Noblebond EXT 1 gal. to bond membrane to floor ( or thin set). We can cut rolls so your only buying what you need, (either Valueseal or CIS), then latex Mod. to set tile. Sealing asbestos cutback on epoxied cement slab. water keeps the dust down! 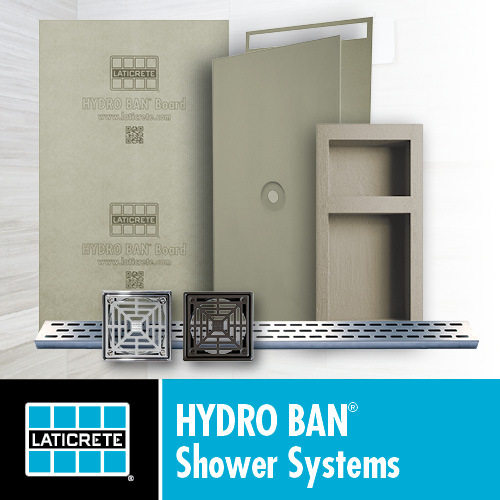 Gypsum Board was removed by the TCNA and ANSI standards for use In wet areas. The Gypsum Assoc. (the manufactures of the board) were in agreement that it should not be used in wet areas. I don't care for the radius of the pan at the up turn .Mud will either be thin or potentially rip out the pan. yep waiting till next day is pretty normal..
With Pro-Slope, install it in morning ,do the pan, install bed, then the tile ! Saves you a day and a return trip in allot of cases..
I’m not sure who was actually there? Daltile? Swiff train? .?? yes cement pools leak if not waterproofed. Based on the title I was pretending I did know! The link on post number 27 eliminates the entire tarpaper, lath ,slope ,element.. not to mention half of the mortar. Quickcrete -sand topping mix.-add about 20% sand to it,or 4 bags to one.. It isn't necessary but if it makes you sleep at night people do it...I wouldn't but people do. For the most part water will not hurt the mortar..(think of a cement slab or bridge) it just wont stop the water from going through it ,that's where the waterproofing comes in. the first mortar layer provides the slope for the waterproofing.The layer over the waterproofing is the bonding surface for the tile..
Ditra Layer Over Ditra Heat Layer? Get it in writing spelled out very clear.. If it goes bad no one will remember who said what. how are you handling the connection of the membrane to a light fixture to insure a vapor tight connection? yep-Noble has had 6' rolls for about 25 years.. On walls while it does eliminate a seam can be a tad cumbersome. What...You mean the guys who make the thin set were right the whole time...? Dave Rodgers is one of the best. Still a fisherman from up north,just not Noble!